Our current guests Eric and Patricia from ‪‎Sarasota‬, Florida this morning with three wandering handworkers practicing a tradition that is more than 1,000 years old. 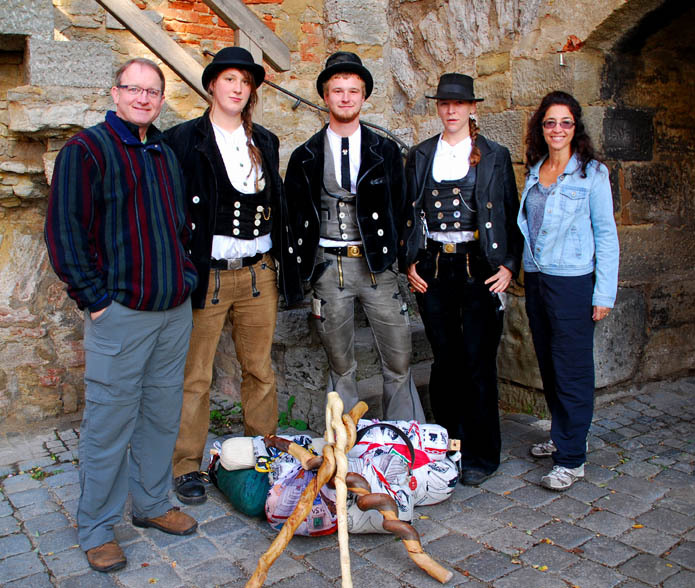 The (left to right) fruit farmer, blacksmith and finish carpenter from various places in Germany are on a three year trek around the world to learn their trades and become masters. During this period, they may not come closer than 50 kilometers (about 30 miles) to home, they may not use cell phones or trains or cars. They must rely on the kindness and hospitality of strangers as they seek work, hitch rides to potential jobs and get their ‘report cards’ filled out. Then they return home and if they pass the final test, they are masters of their craft. Not all handworkers go through this initiation, it is voluntary. For these three adventure seekers, it is all part of maintaining living history. Those heavy corduroy suits are their work and travel clothes no matter if it is 10 below or 110 above. A great moment for Eric and Patricia to witness in a medieval town. Posted in Germany Tours and tagged ancient, apprentices, custom, derheim, designed, european, focus, germany, james, private, rothenburg, tours, tradition, wandering.